✅ Trip Verified | For a city that is supposed to be a prime tourist destination, Venice is poorly served by Marco Polo airport. I arrived on March 24 2019 aboard a fully loaded (160+ passengers) Boeing 737-800. Upon arriving at Venice, the passengers (many of whom had mobility problems) were forced to walk down a steep stairway and then loaded onto to two buses. So, here we have two buses, passengers crammed in like sardines with nothing to hold on to except metal poles or overhead straps. The bus driver made an abrupt stop, throwing the majority of the passengers off balance. Some fell. I managed to hang on to the overhead strap but the person(s) behind me lost their balance and hit me hard in back. (I had a sore back for several days.) Passengers who required wheelchairs only received them after the bus had arrived at the gate. Shame on you, Marco Polo Airport. You're negligence will eventually lead to a major lawsuit and further disrepute for the airport, the city of Venice, and Italy itself. Not Verified | Worst airport in the world. 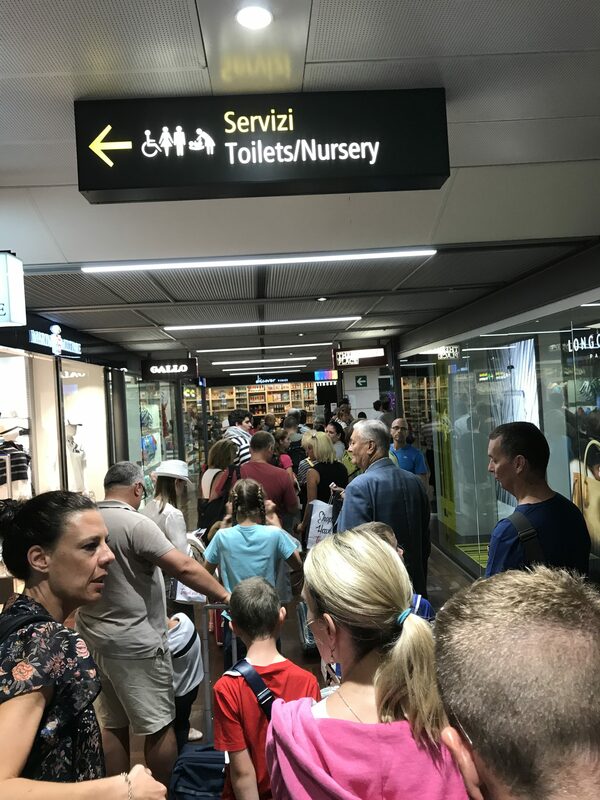 For such an important tourist place, Venice needs a bigger, more organized, better staffed airport. Arriving and departing is a nightmare, there are 12 immigration booths but only 3 or 4 are staffed in the rush hours, and the staff simply don't care. There is no information, no help, no air conditioning, people are forced to queue outside at 40 degrees Celsius, and it is so disorganized, it's pure chaos. Departing is just as bad, don't bother checking online, they will force you to queue again (surprise!) and after you pass security you have to queue yet again for a passport control? The waiting rooms are cramped, poorly ventilated, extremely disorganized, as usual there are no signs or staff to help, and the whole experience feels worst than rush hour in the New York city subway. Avoid this airport if you can. ✅ Trip Verified | On arrival at the airport my wife twisted her ankle, the flight attendant immediately organised a wheelchair and my wife was treated at the first aid station. After her treatment she was driven to the water taxi, advised where to attend hospital for x-ray and assisted on and off the taxi. I cant praise the staff enough for their thoughtful and professional attention, and contrary to popular belief when I offered the driver a tip he refused saying 'this is what we are here for', we went on to have a pleasant 3 day visit to Venice. ✅ Trip Verified | The airport was something else, I feel this is a flight I have done many times without problems. But on this occasion, returning from Venice. You go through security then into big concourse of lots of shops and practically no seating - obviously to kep you moving and purchasing. You cannot leave this, so inevitably you have to keep walking around. I think I counted about 20 non food purchasing seats. From this there are 3 exit areas leading off to 30 possible gates. You cannot leave this area until your flight gate is depicted on the screen. So this area is heaving. Our gate was announced - but astoninishly our Bristol flight checks were having to pass through the same 1 of the 3 exits as concurrent flights to Edinburgh, Canada and I think somewhere in Russia. So you have 3 definite flights (possibly 4) all trying to pass through 1 gate into another area - 300 on each flight = 900 (could be 1200) plus people through a gate. We queued for over an hour and after this time we saw a screen saying - gate closing for our flight. No one was coming around to extract people from the queue if their flight was closing. Jumping the queue was required, not particularly well accepted, understandably. Once through this gate there was a further queue - about 10 windows to check ID but 5 of these were closed. Another push to the electronic passport check - so slow for many of the checks, I think the people might have moved but it all had to restart. What an appallingly arranged system, utter shambles. Not Verified | Absolute chaos. 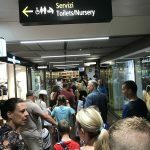 You can’t go through passport control until you know your gate, by that time the queue was 200m long, meaning last call as you are queueing and then being fast tracked through, unbelievably the flight arrived in Bristol on time, no thanks to airport. ✅ Trip Verified | On arrival after fog delay it took 90 minutes before our baggage arrived on the carousel. Absolutely no organisation whatsoever! On arriving at the airport to check in for the journey home we had a huge queue to contend with before we could get to the checkin desk. Then went through security which was ok. 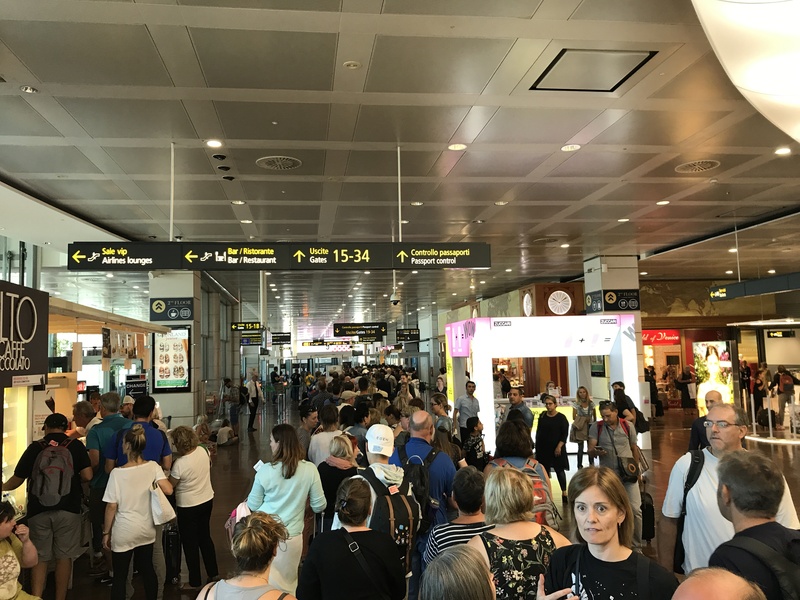 However after that there was a 150m plus plus queue to passport control (after cafes and shops) before we could go through and then get to our Gate. The pilot had to wait for all his passengers which made our flight 1 hr late taking off. Again no organisation! About time Venice airport looked at their staff training. Abysmal. Will avoid whenever possible. 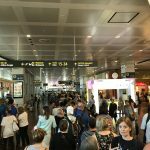 "done and dusted in 20 minutes"
Not Verified | I am not sure which Airport the negative reviewers were at, but my experience is different. Maybe it is just a case of getting there early. I read the horror stories and arrived almost 3 hours early. I was done and dusted in 20 minutes. Most of the time was spent at the United counter because they had trouble finding my esta. The mistake I made was in going through the U.S. passport control a bit early. I have to occupy my time by writing a review. Oh, and the WiFi is quite good too. Not Verified | Overall, it wasn’t too bad of an experience. It was easy enough to check in. I was disappointed in the Firsf Class Lounge. Very little food options and many weren’t very good. I specifically asked if there was shellfish in any of them because of an allergy, but noticed a canapé with shrimp on it. Very few alcohol options, though plenty of non-alcohol options. The staff were helpful in getting me a bag of ice for an injury. ✅ Trip Verified | Worst ever experience and I have been at many airports. Queues, chaos, rude staff, disorganised, no communications. What else can I say - avoid if you can. Not Verified | Queues everywhere! We arrived at the airport and had to check in as we had booked with an external company so couldn't check-in online. There were 3 check-in desks for our flight, ONE of which was open for the first half hour. One more desk was then opened and then one more after an hour queuing. We queued here for about 1 hour 45 minutes, just to check-in. Afterwards we found ourselves in the security queue which was another 20 minutes. Got through security with about an hour to spare before our flight was due to board. Got through, found what departure gate we had to go to. It wasn't far, however it took us almost an hour and a half again to get through the passport control. We were told by one of the girls working there that one line would be quicker than the other, boy was she wrong - she told us to go the queue where theres an actual human checking the passports, but it took forever - the lads checking passports looked like they couldn't give a damn. At this stage I'm in a panic thinking the boarding for my flight is finished - it's 11.45, flight due to leave at 11:55. I rush to the departure gate to find.......ANOTHER QUEUE!!! This queue was to show boarding pass/passport - fairly standard procedure. Once we got through this, we had to queue again! This time for the shuttle bus to take us to the plane. Arrived at the airport at around 9, and by the time we got on the plane it was 12:15 for an 11:55 flight? 3 solid hours of queuing, not easy for me, a 28 year old, imagine the poor kids/elderly people that have to go through all this too! They need to up their game in this airport, do away with the passport control in departures, it's not something that's done in all airports. It's an airport I will be avoiding - which is a shame as Venice is somewhere I would love to spend some time, but won't be doing so if this is the case all the time. Anything I have picked below as N/A is because of all the queues I had no time to look into any of it!!! Where you're supposed to find the time in 3 hours queuing good only knows!